228 in stock Need More ? (12a) Suitable for 12 years and over. 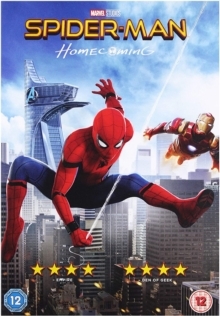 Tom Holland stars as the eponymous superhero in this Marvel Comics sequel to 'Captain America: Civil War' (2016) that sees a young Peter Parker realise the full extent of his powers as Spider-Man. As a 15-year-old kid struggling with the everyday turmoil of being a teenager including school, homework and a crush on a girl who's out of his league, Peter also has to deal with the fact that he is Spider-Man and has the ability to change the world. When he meets with Tony Stark aka Iron Man (Robert Downey Jr), a seasoned superhero who tries to pass on some words of wisdom, Peter is told that his priority should be working hard at school to get good grades, not donning his Spider-Man suit and fighting crime, but for Peter the urge to stop bad guys is just too overwhelming and he tries to find a way to do both. The cast also includes Michael Keaton as Adrian Toomes aka The Vulture, Michael Chernus as Phineas Mason aka Tinkerer and Marisa Tomei as Peter's Aunt May.